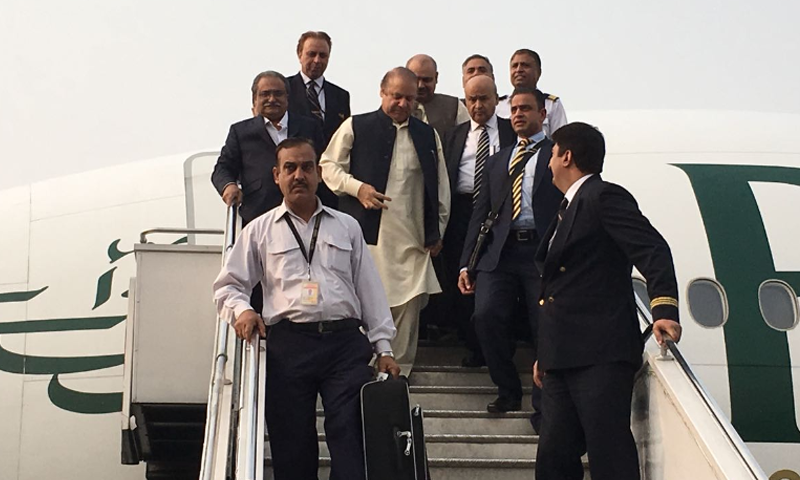 Disqualified prime minister Nawaz Sharif arrived in Pakistan on Thursday, less than a month after he left for London, to appear before an accountability court in connection with the corruption references filed against him by the National Accountability Bureau (NAB). Pakistan International Airlines (PIA) flight PK-786 carrying Sharif landed at Islamabad’s Benazir Bhutto International Airport at around 8:20am. A large number of PML-N supporters and party leaders including Senators Asif Kirmani and Pervaiz Rasheed and MNA Dr. Tariq Fazal Chaudhary turned up at the airport to welcome him. 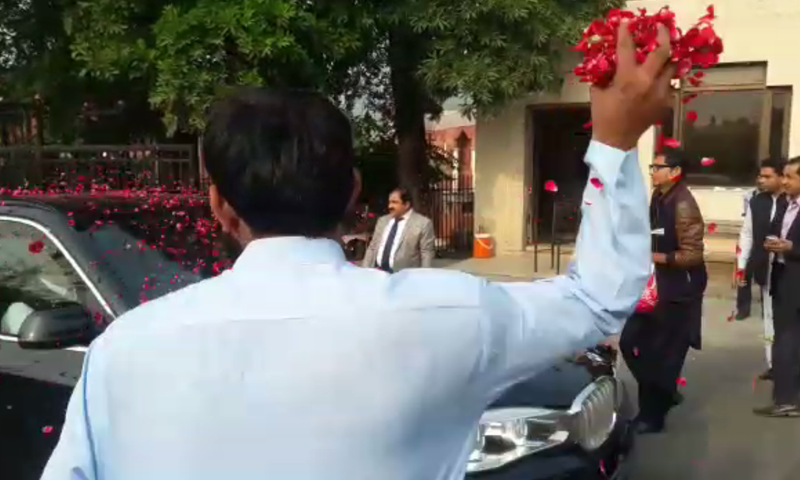 Minutes after landing, Sharif along with his motorcade left for Punjab House where he is expected to address a meeting of party workers later in the day. The aggressive language used by the disqualified prime minister in a TV interview before his departure from the UK capital negated the reports that appeared in the media in the wake of a high-level meeting of the ruling PML-N in London on Monday suggesting Sharif had been convinced to give up confrontation with state institutions. 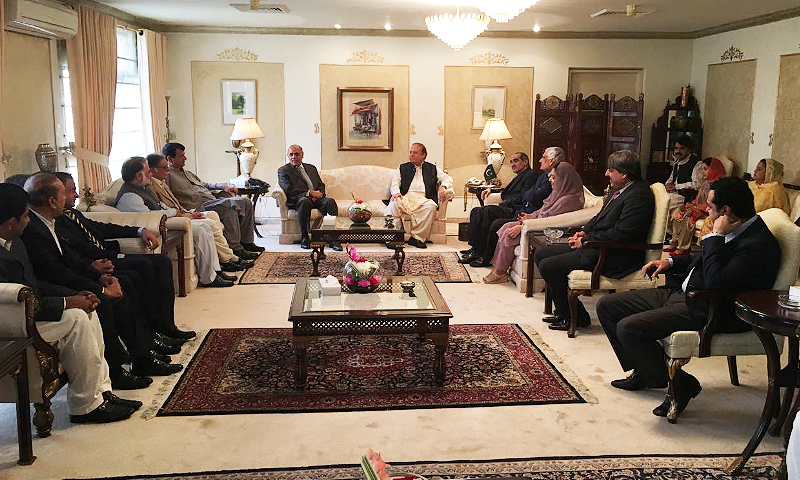 Prime Minister Shahid Khaqan Abbasi, Punjab Chief Minister Shahbaz Sharif, federal ministers Ishaq Dar, Khawaja Asif and Ahsan Iqbal had attended the huddle. “Taking revenge in the name of accountability is unacceptable,” the former premier said in the interview, putting a question mark over the ongoing accountability process against him and his family. “What scandal have I been found involved in? What’s the issue? What’s the charge sheet?” he said in a reference to his disqualification for not mentioning in his assets declaration the salaries he didn’t receive from the UAE-based company of his son. He alleged that cases against him and his family were being fabricated and that the Panama Papers case verdict became a source of embarrassment [for the nation]. Despite all these reservations, Sharif said he would appear before courts to show his respect for the judiciary notwithstanding the ailment of Begum Kulsoom, who needs his presence as per doctors’ advice. The former first lady underwent a second round of chemotherapy in London on Wednesday. The ousted prime minister had earlier appeared twice before the accountability court after his pleas for exempting him personal appearances keeping in view the ailment of his wife were rejected.